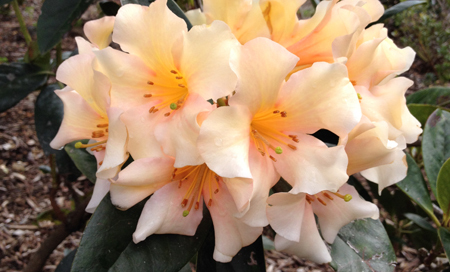 I hope our readers get enjoyment from reading this year’s volume of The Rhododendron. Once again on your behalf I sincerely thank those who have provided contributions. We are without some of our more-or-less regular contributors this time. And, of course, the thinning of ranks of accomplished and knowledgeable older members takes its toll on the contents of the Journal just as it does on the life of the Society itself. As I wrote last year, we’re ready and willing to welcome new contributors. Both articles and photos are welcome. And we’re just as keen to have members’ suggestions on subjects they’d like to see covered in future issues. When it comes to photos, it should be very much easier to locate images of selected plants (and other subjects of interest) included in the very extensive library amassed over the years by the Victorian Branch, following their transfer to digital records as described by Simon Begg in an interesting article we carry this year. It would be worth bearing this in mind if you might have an inclination to write on a subject but are not in possession of photographs which might be suitable to illustrate it. Alternatively, if there’s a particular plant which you’d like to see covered in our pages, then it should be that much easier for us to respond in the future.